I was so proud when Isabelle Kenyon contacted me to ask if I would contribute my poem, The Space Between Sounds, to this fantastic calendar. 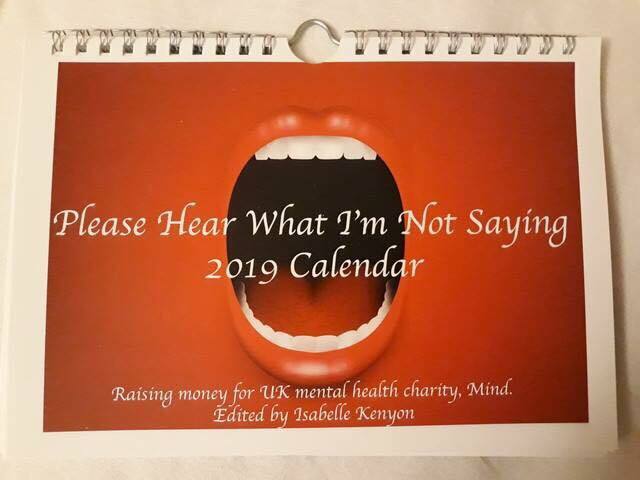 The calendar not only raises funds for the mental health charity, Mind, but also gets people talking about issues that were once taboo. Together, let's break down the barriers around mental health! After two years of studying I'm proud to say I've now graduated with a Masters in Creative Writing from the University of Stirling. Wow! What a fun afternoon this was. Wings to Fly, in the gorgeous setting of The Wine Library. Many thanks to the amazing, Janet Crawford for inviting me to take part in the event. I don't know where she gets her energy from but the world's a brighter place because of everything she does! Derek Steel is one of those guys who just gets things done. And he doesn't do things by half so I knew the launch of Razur Cuts V was gonna be a big night - and I wasn't disappointed. Staggeringly, Derek does all of this to support others. And his encouragement pays off! Writer, Julie Rea, had her first published story in Razur Cuts III and went on to be a recipient of Scottish Book Trust's Next Chapter Award. Her short story, Shark Tooth, will appear in the next edition of New Writing Scotland. ​Julie says being published by Razur Cuts gave her 'the confidence boost to send submissions to other literary journals and magazines. Derek is a champion for writers. Love his passion, dedication and spirit. He's a true maverick!' I couldn't agree more but would also add that I love his t-shirts! Julie Rea, me, and Fee Johnstone. Writing can be a lonely business and so it's always great to get along to these events and meet other writers, who you may only have previously met on Twitter. The support and encouragement for each other never ceases to amaze me and is priceless. Fee Johnstone is a young writer with incredible talent. Check out her short story, Till Cheese Fondue Us Part, in Razur Cuts V.
Women were outnumbered on the bill on Saturday night but it was great to see stand-up comedy being represented by one of Scotland's freshest faces, Mico Hunter. Her set was fast-paced and feisty, and it was great to see both men and women cheering her for her feminist humour. The evening was bursting at the seams with talent and if I tried to name everyone it would be almost impossible. There were voices I'd heard before that I love, and there were voices that were new to me that I now love. And me? Well I'm chuffed to bits to have the opening chapter of my next novel in the latest edition. The magazine is available to order direct from Razur Cuts (find them on Facebook here). It costs £4.50 payable via PayPal to deeko1963@googlemail.com and is worth every penny! Last Friday night saw the opening to the Hidden Door Festival in Leith. The event took place in the Old State Cinema and it was incredible to see how the team had transformed the building in such a short space of time. The University of Stirling is officially 50 years old and to celebrate they ran a fantastic evening of art, music, film, and - of course - readings from their publication, happening 67. The audience was small (apparently, there was a wedding on? ), but they were great! They laughed along to Martin Raymond's memoir, thoughtfully considered the poetry on drug addiction from Sarah McLean and Alisdair Hodgson, and they were moved by the short story, Embers, from Swaksha Krishnakumar. ​I discovered that my own short story, 33 rpm, can quickly divide an audience by age as I found myself having to explain the title to younger fellow students! Oh well, I wonder what piece of technology they hold in their hands will one day need explained to a future generation? Mobile phones, perhaps? Laura Fyfe and Clive Wright did a fantastic job last night, hosting an evening of poetry, prose and music as part of the Stirling Book Festival. What more could you want on a Thursday night? And special congratulations to the super talented, Sarah McLean who won the prize for Best Newcomer. Sarah's piece was from the novel she's currently writing on the Masters Course at Stirling University. ​Brilliant title, brilliant setting and brilliant performances! A massive shout out to Sweet Pea Photography for taking the photographs. This poem was written in response to the latest Florida Shootings. It was recently published by the Bombay Literary Magazine, and you can click on the image to hear me read it on SoundCloud. Thanks to writer and novelist, Helen MacKinven for hosting the second half. Last Saturday night, I was delighted to be invited to launch Wings to Fly as part of the #oneweekendinfalkirk arts festival. Ian Maxtone, who works extremely hard as the events co-ordinator, asked me to share my inspirations for writing, and talk about the journey towards getting published. I got a chance to read some poetry, as well as some extracts from A Beautiful Game and, of course, Wings to Fly. Thank you to everyone who came along and made the evening so special. Janet Crawford joined me to share some of her inspirational poems. The official launch of Wings to Fly was held in Cafe Bar 1912, and I couldn't believe two years had passed since the launch of A Beautiful Game. I took the opportunity to read my short story from the anthology, Mixing the Colours, and spoke about how it developed into a full novel. Thanks to everyone who came along - your support is incredible! Many thanks to Upscale for adding some fabulous music to the event! As part of Book Week Scotland, I was invited along by Mid Calder Library to host an evening to celebrate our nation's love of reading. It was a fantastic evening of fun, which included plenty of audience participation. We laughed as we relived the 80s, remembering fashion statements such as legwarmers and shoulder pads! ​I'd like to say a massive thank you to everyone who came along, as well as to the staff who stayed behind late to make sure everyone got their book signed. I'm chuffed to be included in the next edition of [Untitled]. A brilliant afternoon of poetry outside the Scottish Poetry Library to mark the first day of the Edinburgh Fringe. "A West Lothian teacher has penned a new book which was inspired by children who suffer football-related violence at home. And while Emma says the lead character is not based on any one child, she says she hopes her novel, A Beautiful Game, will help inspire all families in similar situations to get the help they need." Read the interview with Jenny Morrison from the Sunday Mail. "AS primary school teacher Emma Mooney listened to the football results each weekend, she admits she used to subconsciously hold her breath. Emma wasn’t a football fan and, to her, it didn’t matter which teams won or lost. But she still feels haunted by her early years as a young teacher when she realised there were children in her class who were likely to see their mothers being beaten or be abused themselves if their father’s favourite team didn’t win." “Juggling work as a part time teacher, mother to three children and having the staying power to write and see a book through to publication is an impressive feat. Read the interview with Helen-Jane from Konect here. Come along and join me at the next Woo'er With Words event. Feel free to turn up at Coffee on Woo'er at 2 o'clock on the first Saturday of each month to hear readings from a variety of talented Scottish writers. A great night was had at the recent West Lothian Writes event at Howden Park Centre. Thanks to everyone who came along.